In training, I often say the phrase Change Is Coming – It will be faster than you think and slower than you want. It may sound contradictory but when you are addressing a mixed audience confined to a room of either whiners or winners the phrase applies. The winners, well, they’re the quiet ones. They absorb and digest and respond by applying what they learn. They know change won’t come easy but they find ways to win their bosses over. Or leave. Like Rosenblum says they can be the change or wait till their bosses die. Mindy McAdams and Jeff Jarvis make the point clear in their recent posts. During the past year I’ve been in a lot of newsrooms and talked to a number of journalists, mostly working at medium-size and larger newspapers, about online. The journalists often wonder aloud whether their managers know enough about online — and note, they are talking about the ones in charge of the online. That’s a stunning statement, in my opinion. And let me add, they were not whining. They may have sounded a bit angry, or disgusted, but not outraged. It’s mainly a statement of fact. The editors and publishers — and yes, all those folks in corporate — don’t have a clue. It’s more and more obvious. But the reporters and designers, editors and producers, were there too. Just like solders in a war, or average German citizens in Nazi Germany. They were there, watching the terrible decisions being made and going right along with them. If you have no leaders, step up! Journalists are such a whiny bunch, always complaining, constantly blaming someone else for their problems. But friends, as the Rev. Wright would say, the chickens are coming home to roost. Newspapers and newspaper companies are about to die. The last remaining puddles of auto, home, job, and retail advertising are about to be sucked down the drain thanks to the economic crisis and credit is about to be crunched into dust. So any newspaper or news company that has been teetering will fall. If Fannie Mae, Freddie Mac, Lehman Brothers, and AIG can fall, so can a puny newspaper empire — and there’ll be no taxpayer bailout for them. When this happens, will it be Sam Zell’s fault? Hardly. When the internet came, did you all – every one of you as responsible, smart journalists, on your own – leap to get training in audio and video? Did you immediately hatch new ways to work collaboratively with the vast public of bloggers able and willing to join in local journalism? Not that I saw. When the link economy emerged, enabling papers to find new efficiencies by saving resources long spent on commodity news so they could concentrate on their real mission — local — did you grab the opportunity by the horns and beg to cover the hell out of Encino? No. 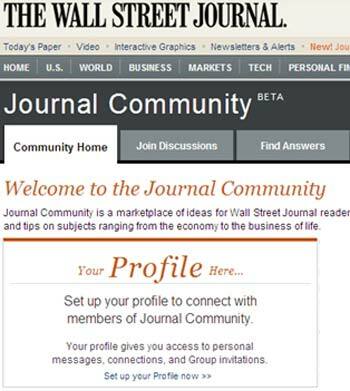 AP’s Anick Jesdanun writes that WSJ.com will start its own social network from scratch. “We believe that in the future, social networks are going to be an important means of distributing content and of spreading news, and we want to be a part of those networks,” says Alan Murray, a deputy managing editor. The new “Journal Community” launches Tuesday for paying subscribers to create and share personal profile pages with their real names, job details, interests and photos, similar to services at Facebook and LinkedIn. The Journal plans to open the social-networking features to nonpaying visitors in future. The AP report states that only 5 percent of the site’s users are currently paying subscribers. Latest ccomScore stats says WSJ.com had 4.7 million visitors in July, nearly twice July 2007’s total of 2.4 million. One wonders whether WSJ.com’s cautious approach, aiming for such a small pool of “well-heeled executives” will gain any traction. WSJ.com hopes that its insistence that users post their real names — verified against their subscription info — will ”increase the quality of discussions.” That seems highly unlikely. Mixing free and paying within the same site is always a pain for navigation. Free users — frustrated too often by clicking into restricted areas — will eventually exclude the site from their most frequently visited list. Paying subscribers who already social network-savvy may find the walled garden too claustrophobic. This convo speech by Adrian Tan, a Singapore lawyer, is becoming viral online. Reposted here as a record of what makes a great speech. the average life span of a group of people. But I’m here to talk about a bigger idea, which is what you expect from your life. Most of you will end up in activities which involve communication. To those of you I have a second message: be wary of the truth. 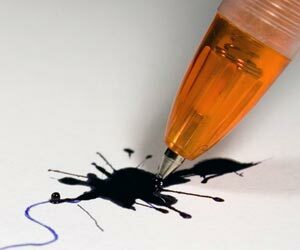 I’m not asking you to speak it, or write it, for there are times when it is dangerous or impossible to do those things. The truth has a great capacity to offend and injure, and you will find that the closer you are to someone, the more care you must take to disguise or even conceal the truth. Often, there is great virtue in being evasive, or equivocating. There is also great skill. Any child can blurt out the truth, without thought to the consequences. It takes great maturity to appreciate the value of silence. It’s not as easy as it sounds. Do you know anyone who hates you? Yet every great figure who has contributed to the human race has been hated, not just by one person, but often by a great many. That hatred is so strong it has caused those great figures to be shunned, abused, murdered and in one famous instance, nailed to a cross.